Flamingo ® was established in 2006 and has become one of the leading car care brands in the world in just over a decade. The brand’s success can be attributed to their relentless commitment towards continually researching and improving their products that allow consumers to give their cars the complete care package. Even though it is mainly a Chinese company, Flamingo ® brand and its products are extremely popular in North America and are expanding to all over the world because of their understanding of the consumer requirements for car care and their ability to provide what the average car owner is looking for. 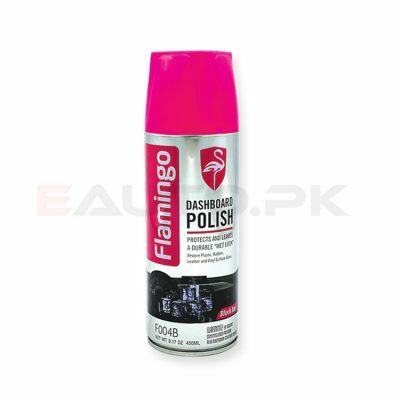 EAUTO.pk gives you the opportunity to shop online for the best quality Flamingo ® car care products from the comfort of your home. You can browse and purchase any Flamingo ® product from our website and we will deliver it to your doorstep. Flamingo ® manufactures all the car care products you could ask for. Whether it is spray protection that allows you to protect your car surface from the harshness of the road or car wax that shines and protects your ride, Flamingo ® makes the top quality products that will ensure the protection of your ride. You can even customize your car with Flamingo ® products such as rubber sprays that are quick dry, peelable coatings that can be applied to metal, glass or plastic and allow you to add a personal touch to your car. Flamingo ® also caters to the inside of your ride by manufacturing dashboard polishes, sticker removers, leather protectants and shiners. Or shine and protect your car tires and rims as well with Flamingo ® tyre polishes, protectants and cleaners. All of these products are carefully manufactured after thorough research by Flamingo ® so that they may be able to satisfy consumer needs to the best of their ability. By using the “Search by Brand” option on EAUTO, you can find all Flamingo ® car care products at the best prices in Pakistan.